Review by Diane R. Wiener, M.S.W., Ph.D. This groundbreaking book takes as its premise a series of commitments to bridging myriad gaps, anew. In its formulations, which critique overtly but likewise adopt necessarily the specificities of academic publication requirements, a plethora of people's divergent disability ("crip") identities and variegated mental health/illness ("mad") identities no longer need to be split (no pun, here) along an already false binary line. As the contributing authors demonstrate in various ways, by exploring fictional, autobiographical, imagistic, media, and other forms, one might self-identify not only as "both" disabled and as mentally ill, emotionally variant, mentally divergent, psychiatrically labeled, etc., but, in doing so, far greater coalitional work can arguably be accomplished in the face of dominance and oppression by upending the trenchant border between crip and mad, once and for all (unless someone, for their own very good reasons, chooses not to adopt such a perspective – indeed, their prerogative). Each of the contributors, and Donaldson, herself, asserts uniquely that within what, for many, has long been an irreconcilable tension, lies a dynamism that is far more like a sea with its tributaries and other fluidities, both salty and fresh, than an episteme that is static, akin to a fence, or, worse, a wall. Over the decades, as well as, in some cases, more recently, Elizabeth Donaldson, Peter Beresford, David Oaks, Sally Zinman, Tina Minkowitz, Patty Berne, Nev Jones, Leah Lakshmi Piepzna-Samarasinha, Margaret Price, and many others have asserted the pivotal importance of mental health liberation and mad pride to disability pride, identity, culture, studies, and justice, and vice versa, further indexing the problem of what is often referred to as hierarchies of disability. As is pointed out frequently during rallies, in faculty and staff meetings inside and outside of the academy, within poetics, on blogging platforms, and in classrooms (among other sites), disability hierarchies tend to elide the presence of "hidden" disabilities, including, but not only, mental, cognitive, intellectual, and emotional disabilities that may or may not co-exist with physical disabilities, in the very broad variety of disabling experiences. This pattern of erasure, a form of social violence, is both refuted and undeniable, throughout the book. Importantly, disability, its representations, and lived experiences are and never were only about American exceptionalism, a sea of whiteness, the primacy of masculinity, heterosexual dominance, Christian hegemony, etc. Disability must be imagined and understood, always, as interconnected and mutually informing, with respect to many axes of difference, both privileged and disenfranchised (sometimes, at the same time). The book's authors, aforementioned activist-scholars, and others have therefore worked within -- and, in some cases, against -- the mad and crip binary. In her now famous formulation of (the) "bodymind," as explained in her foundational book, Mad at School, Margaret Price explains the impossibility as well as the irresponsibility of separating the body from the mind (Descartes: take heed). Underscoring a "bodymind" emboldens solidarity, honesty, and self-actualization; breaks down barriers, without condescension or promises; and advances the premise that informs Donaldson's volume. What is spectacularly unique and invigorating about greeting Donaldson's volume, then, is not exactly that the underlying debate is new, but, rather, how each of the contributors takes up and engages vividly with texts, epistemologies, approaches, participants, and audiences. This work is accomplished in most cases either by addressing often visited people and ideas in truly new ways, or via discussing texts that, prior, were apparently never critiqued or brought into a public sphere. 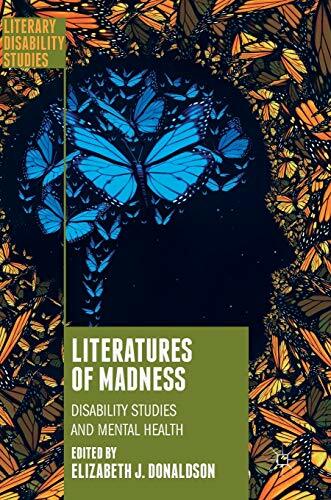 The long and often painful gaps and sediments that have existed between the disability rights movement and the mad pride movement may never fully disappear, but this book takes them for quite the centrifugal spin. In the book, this reader experienced an archaeological dig met by a skyward-facing transformation, with neither rocks and mud nor visual gaze as its key points or goals. Honoring Shulamith Firestone, and her book, Airless Spaces, published twenty years prior, Donaldson welcomes the reader to find "new space and more breath." This reader nods: Yes. With affirmation often comes a set of questions. How did we, the mad, "get here," to a historical moment when this book can be in the world? Who are our heroes (if we buy into heroism, in the first place)? How do the authors teach us to find new or renewed heroes among those we may not have known about or imagined in certain ways, previously? What are the goals of the mad pride and disability pride movements, in the early 21st century, locally, regionally, nationally, globally? What does solidarity mean, to and for whom, and under what circumstances? What are the different conventions, heuristics, and strategies to advance change, combat stigma, and raise critical consciousness, including through literary and cultural analysis, so that everyone in these movements can access, contribute, engage, and be informed, in an egalitarian way? The book is catalogued into three main sections (Mad Community, Mad History, and Mad Survival). In its attention to numerous global contexts, voices, and stories, particularly the often least powerful within an already oppressed minority group, the book's design and architecture (community, history, survival; madness as core), like its specific contents, remind readers how the laborers advancing equity and demanding justice in the form of politicized social movements – including mad pride and disability pride – must insist upon civil liberties as an unwavering fulcrum. It is well-known but not always practiced that these movements need to be led by and comprised of the marginalized people, ourselves ("Nothing About Us Without Us") and our allies (accomplices, co-conspirators). Our collective action often produces and is accompanied by numerous origin and legacy narratives. In several respects, Literatures of Madness records a few of these narratives, ones that are not often known in mainstream parlance, but will -- or could -- be now.